We Beat The Competition Everyday! Our Master Mod Controllers have the highest number of features and mods available anywhere. When we redesigned our Xbox One Mod Controllers. We decided to include Everything! 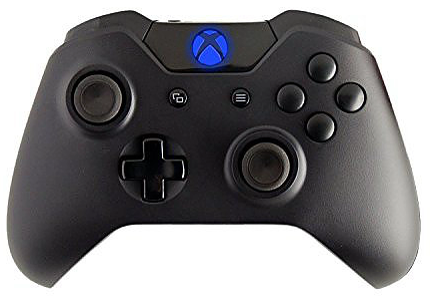 This controller offers features that a standard controller does not offer however, these features can be turned off at any time and the controller will function as a standard controller with any game. 10: Controller Feature Quick Reference Introduction The ModsRus Mod controller offers many features, more than you will find on any other mod available. While there are many features on this controller, we have developed a method of accessing them which makes it quick and easy. On the following pages you will find information about each feature and how to access it. Many features can be used in combination allowing greater flexibility. The Xbox One Mod controller uses the “LEFT” and “UP” directions on the D-pad for accessing all of the controllers features. We also offer the option of “MOD”buttons on the back of the controller. The mod buttons can be used instead of “LEFT” and “UP”on the D-pad to allow faster access to features since you would not need to remove your thumbs from the thumbsticks. When enabling/disabling a feature, unless otherwise noted, you will see the White Guide Button LED flash 1 time for enabled and 2 times for disabled. Rapid Fire To activate/deactivate rapid fire you can either TAP “LEFT” two times very quickly or HOLD the “RIGHT TRIGGER” and TAP “LEFT”. The WHITE LED will start flashing indicating Rapid Fire is now activated. Repeat either of these to turn off Rapid fire. With the Optional “MOD” follow the same procedure using that button. You can also control how the LED flashes using the Advanced Feature Management (page 9). Burst Fire To activate/deactivate burst fire HOLD the “X” button and then TAP “LEFT”.The WHITE LED will turn on solid to indicate that burst fire is activated. The burst fire will fire at the current speed/burst settings which can be adjusted within programming mode. Once activated burst fire can be turned on/off using the same process as rapid fire. To deactivate again hold “X “and tap “LEFT”. Akimbo (Dual Trigger Rapid Fire) To activate/deactivate akimbo HOLD the “LEFT TRIGGER” and TAP “LEFT. With akimbo activated you will have rapid fire on both the left and right triggers (independently), this is great for akimbo or dual weapons in Call of Duty and other FPS games. Sub/Edit Modes Several of the following controller features have sub modes. Sub modes are modifications to the main feature. These will be explained in the description of each feature. To change a features sub mode HOLD “UP” + “LEFT” on the D-pad, while holding both, tap the corresponding features button to change the Sub-Mode. For example, to change the Jitter sub mode you would HOLD “UP” + “LEFT”, then TAP ”Y”, the WHITE LED will flash to indicate which sub mode you are currently in. If using the optional “MOD” buttons you would HOLD both “MOD” buttons. Mimic (Auto Akimbo) To activate/deactivate HOLD the “RIGHT TRIGGER” and TAP “UP”.When using mimic , the right trigger controls both the left trigger and the right trigger at the same time. If the akimbo is activated and rapid fire is turned ON than the left trigger will also rapid fire, otherwise it works as normal allowing you to scope automatically when firing. Turn Off All Features To Quickly turn off all features that may be turned on you can HOLD “BOTH THUMBSTICK CLICKS” and then TAP either “UP” or “LEFT”. The WHITE LED will quickly flash 10 times and all features will be turned off. The adjustable fast reload allows you to shave precious milliseconds off your reload time. This works by cancelling the last part of the reload animation after the ammo has been added to your weapon. The fast reload must be set for the weapon you are using, as all weapons have different reload times. To set the reload timing you must HOLD “X”until you see your ammo indicator at the bottom of the screen show that you have full ammo (this will happen before the reloading animation completes), when you see this RELEASE “X”. This sets the timing and the next time you reload as normal by hitting “X”the last part of the reload animation will be cancelled allowing you to begin firing again sooner than normal. Jitter currently does not work with Ghosts but has been left in for Future COD games. Quick Scope To activate/deactivate HOLD the “LEFT TRIGGER” and TAP “UP”. With quick scope active just hold the left trigger and you will scope and automatically fire at the speed set in the edit mode. Edit Mode is accessed the same was as sub modes. The LED will Flash 10 times when entering/exiting the edit mode. Hold Only LT –Test the currently set speed. Tap UP on D-pad –Makes shot happen earlier (LED flashes once) Tap DOWN on D-pad –Makes shot happen later (LED flashes Twice) Tap RIGHT on D-pad –Turn Rapid fire with quick scope ON/OFF Hold LEFT on D-pad, Then Hold LT –Set new Quick Scope speed. Recording starts when you press LT and stops when you release LT or press RT. Tap the View Button –Exit Edit Mode. Auto Aim The auto aim feature ONLY WORKS WITH ZOMBIES & CAMPAIGN GAMES. IT DOES NOT WORK WITH ONLINE MATCHMAKING GAMES. To activate/deactivate auto aim HOLD “A” and TAP “UP”. With auto aim active, when you press the left trigger, you will automatically lock on and track the closest target. GOW Perfect Active Reloads To activate/deactivate HOLD “RB” and TAP “LEFT”. Have perfectly timed active reloads for the most popular weapons in Gears of War, automatically. When using this mod you select the weapon you are using by following the process below. Once selected you reload as normal by pressing “RB” and the second press of “RB” will be timed automatically. Sub Mode 1 = Gears of War 1 Sub Mode 2 = Gears of War 2 Sub Mode 3 = Gears of War 3 Set GOW Active Reload Weapon To set the weapon you want to perfect active reload you must HOLD “UP” and TAP “RB”.You will TAP “RB” 1-6 times depending on the weapon you want to select from the list below. When you release “BACK” the WHITE LED will flash 1-6 times to confirm your selection. To change the rapid fire speed you only need to TAP “UP” or “DOWN” on the D-pad. “UP” to make the speed faster and “DOWN” to make it slower. The WHITE LED will flash when increasing or decreasing the speed. Once you have reached the MIN or MAX speed the LED will no longer flash. Change Burst Fire Quantity: To change the number of shots fired with the burst fire you must TAP “LEFT” or “RIGHT” on the D-pad. “LEFT”for fewer shots and “RIGHT”for More shots. Check Rapid Fire Speed Setting: To check the currently set rapid fire speed you only need to TAP “Y”. The WHITE LED will give a long flash for the “tens” position short flash the single digit. (example. 1 long flash, followed by 6 short flashes, indicates you are now at speed setting 16) Refer to the table on the next page for all of the speed settings. To check the currently set burst fire setting just TAP “A”. The WHITE LED will flash 2-10 times to indicate the number of shots set for the burst fire. Reset Current Mode to Default Settings: To reset the rapid fire mode you are currently editing to the factory default you must HOLD “X” and “B” for 7 seconds. After 7 seconds the WHITE LED will flash very fast 10 times to indicate the Mode has ben reset. Resets ALL modes, speeds and sub modes to their default settings. HOLD “BOTH THUMBSTICK CLICKS” for 7 seconds. You will see the WHITE LED flash in a pattern of , fast, slow, fast. After this all settings will be set to default , the programming mode will be exited and the chip reset. Rapid Fire Setting Shots Per Second Rapid Fire Setting Shots Per Second Important Rapid Fire Speed Information! The rapid fire mod allows you to set rapid fire speeds up to 40 shots per second, but you must be aware that setting the rapid fire to the maximum will NOT work for most games. All games have limitations on the rates at which weapons can fire. Our default mode settings are already optimized to the fastest possible speeds for the games/weapons listed on page 3. The possibility to change these settings are available for you to experiment with and find settings that best compliment your playing style and to be able to create modes for current and future games which are not part of the default setup. 32 Inch Sound Bar Wireless Bluetooth Home Theater System For Tv Wall Mount Inc..
ModsRus 10,000 Marksman Modded Controllers Xbox One Color Changing Mod Control..
Quickscope Gaming Crosshairs are reusable static-cling decals For Tv Or Comput..
Are you the Store Owner? You can remove this banner and have access to our fantastic premium features by upgrading your online store.